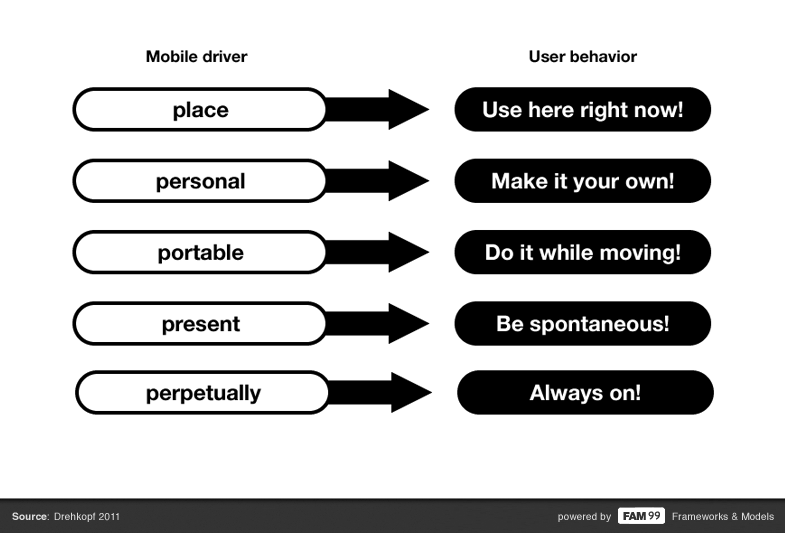 Remembering the five factors of mobile mentality is useful when creating concepts for mobile products and services. Think about what your users can do with their current location and what location can do for them. Think about benefits your service can offer when users have access to it everywhere and all the time. People will use your application on the go. That means they only can spend little attention to your content and features. Therefore focus to create snappy experiences. Present content consumable in short time frames (e.g. standing in the queue). Think about mobile as an continuous connection to your users. You need to design for “always on” – not an end to end experience.